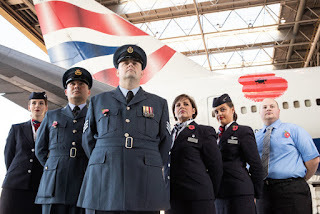 In the centenary year of the end of the First World War, UK airline British Airways has added an 8foot by 8foot remembrance poppy to the rear fuselage section of one of the carriers Boeing 747 aircraft. "It’s important that our aircraft carries the poppy as it is a national symbol of remembrance, and as a national carrier, we should take pride in remembering those that have fallen in all conflicts, new or old, for our country. We have many colleagues that have served or are still serving in Reservist or Cadet forces roles and it is also a thank you to them for their hard work and dedication to the country." said Tom Deary, a British Airways Engineer, Sergeant in 381 Squadron and a former RAF Aircraft Technician. Every year, Tom co-rallies 100 volunteers from across the airline, alongside members of the armed forces, to sell poppies at Heathrow, with the proceeds going to the Royal British Legion. Collections will take place at Heathrow Terminal 3 and 5, at arrivals and departures and there is a Remembrance Wall being displayed in Terminal 5 between 1st and 11th November. British Airways staff will also observe the national two-minute silence held on the 11th November, at 10.55am, all British Airways staff will pause ground operations and engines will be shut down to observe the silence- wherever that is possible. Pictured above and proudly posing with the airline’s poppy artwork are British Airways’ Poppy Day volunteers: Cabin crew Emily Rowlands, Flight Planner Kai Burman, Customer Services Manager Andrea Popkess, Cabin Mechanic Tom Deary (centre), cabin crew Sophie Fox and Fleet Planning Engineer James Hill'. Find out more details on the Poppy Appeal here. Visit the Poppy Shop here.